Many thanks to Ken for the tip pointing to today’s post, and tomorrow’s as well. Ken has performed yeoman’s work in finding new games in the London area, both doing the simple stuff that this site gets around to every once in a while and the really smart stuff (checking planning applications and Companies House…) that this site never thought of. 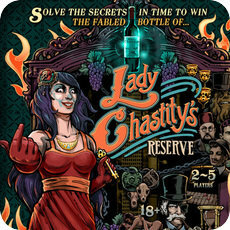 Lady Chastity’s Reserve is the first game by Handmade Mysteries. The web site is exceptionally evocative, with the title graphic having a style all of its own; see what you think, but a starting point might be “Louisiana with a hint of Victoriana”. The tag line “Crystal Maze on Crystal Meth” is about as pithy and witty as it gets, too. The game is played in a pub, by teams aged strictly 18+. It is being hosted by The Four Thieves in Battersea, a short walk from Clapham Junction, until at least the end of July, with the implication that the show might go on the road after that and/or a new story might come to town. As Handmade Mysteries make the distinction, “While ‘escape rooms’ offer challenging tasks, we offer ‘escapism rooms’. A more immersive experience that tests players wits through twisted tales riddled with lateral thinking puzzles and challenging new inventions. You can escape through the exit anytime you want, with the prize in your hands, or just your head.” Perhaps a little more of this live-action adventure happens in your head than in most. The photos on the site set the tone. It’s a game designed to be played by teams of up to five (for a team of more than five would surely end up getting less than a glass of the potent drink each…) and it’s possible that teams of fewer than five might end up sharing their game with others who have booked at the same time. The fee is £18/player. With so many different games available, can newcomers still be distinctive? Evidently so!